: Can other cities learn from New York’s lessons? Walking along the waterfront in Fort Lauderdale and admiring the 60-foot yachts docked alongside impressive homes, it’s hard to imagine that this city could suffer the same financial fate as Detroit. But it is almost as hard to imagine how they will avoid a similar crisis given the sea level rise predicted by scientists. The Miami-Fort Lauderdale area, with 5.6 million people, is “ground zero” in the battle against the rising seas. Perhaps nowhere else in America are the odds lined up so heavily against a region. With a relatively flat, low-lying landscape, and a porous limestone base that precludes levees, the options for this city do not look good. A thousand miles north-east lies New York — another city very vulnerable to sea level rise. But after the wake-up call of Superstorm Sandy, Michael Bloomberg, then the mayor of New York City announced “We cannot, and will not, abandon our waterfront” and launched a $20 billion program to protect the city against the rising seas — at least for a little while. So why can’t Miami apply the same formula as New York City, and go back to relaxing on the beach? And what is this concern about sea level rise in the first place? Most of us have heard of climate change or global warming, but what we may not realize is that about 90 percent of the heat being trapped by increasing greenhouse gases is going into the oceans, not the air. And as the oceans become warmer they expand — causing the sea level to rise. Sea level for most of the 20th century rose at the rate of about 6 inches per century. In recent years this rate has approximately doubled to a rate of just over 12 inches per century. Scientists predict that the pace will increase even more as the large ice sheets of Antarctica and Greenland begin shedding more ice to the ocean. Just how fast sea level will rise over the coming decades is undetermined at this point, but scientists agree on two points: the direction is up and the pace will increase. But what about the costs to the nation from the encroaching seas? They, too, seem likely to rise. Precise predictions of how high sea level will rise in the coming decades are difficult to make, and as a result forecasts vary significantly. 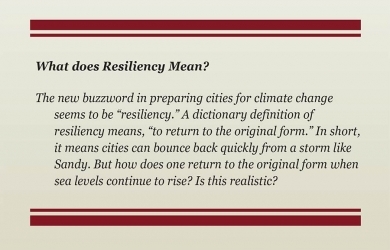 This makes it tough for urban planners who need to know what to prepare for and when those plans need to be in place. To get a prediction his city planners could use, Bloomberg gathered a group of scientists together in 2008 to predict the local sea level rise for the coming years. Their estimates had a mid-range prediction of 11 – 24 inches by the 2050s. They did not predict beyond the 2050s, a key issue they plan to address in their next report and that we will return to later. New York City was in the process of planning for sea level rise when Sandy hit in October 2012. If the city did not have reason to prepare for sea level rise before Sandy, it sure did afterwards. Sandy, a “1-in-70 year storm” with its 9-foot storm surge flooded 17 percent of the city, impacting 443,000 people and 88,700 buildings. It caused $19 billion in damage to the city alone. 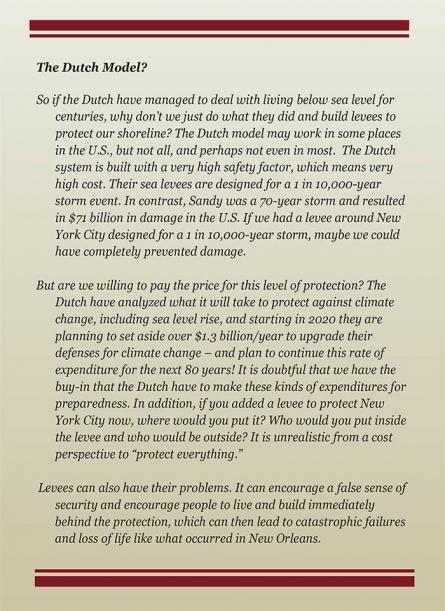 Swiss RE, a re-insurance company, estimated that if nothing is done to protect against sea level rise, a similar 1-in-70 year storm would cause $90 billion in damage to the city by the 2050s. During tropical storms and nor’easters, storm surges pose a bigger threat than the actual sea level rise. Storm surges are caused primarily by an on-shore wind literally pushing the water towards shore. Combined with large waves from the storm, the storm surge can be the most damaging part of the storm. Consider the case of New York City. 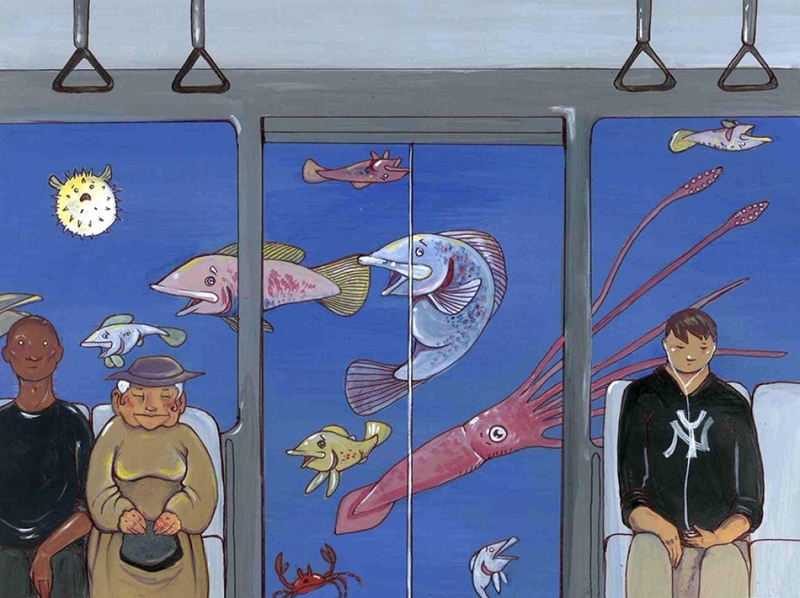 Subway entrances in New York are less than 6 feet above high tide. It would take a while for the seas to rise by this amount. But with Sandy’s 9-foot storm surge on top of a high tide, the entranceways to subways and tunnels were easily breached, causing extensive flooding and damage. Damage to the region’s transportation system alone topped $8 billion. This combination of sea level rise and storm surge is the primary concern for future storms. This level of flooding in New York City may be unprecedented, but consider what a 3-foot sea level rise would do. The figure below shows that with these higher seas all major storms since 1950 would have flooded the subways. So sea level rise is a problem by itself, but combining it with storm surge can place homes, buildings, and other infrastructure that was previously out of reach of a storm within its grasp. After Sandy, Bloomberg stepped up efforts on climate change preparation. He pulled together a group of people and tasked them with coming up with a plan to improve the city’s resiliency to future climate change. Out of this effort came an approximately $20 billion plan to prepare New York City for the 2050s: “A Stronger, More Resilient New York”. Although some of the funds are for rebuilding after Sandy, most of the funds are for increasing the “resiliency” of the city in the face of climate change. The plan is very comprehensive and well-developed, but perhaps the most striking aspect of it is the lack of a “silver bullet” fix for the problem. The plan discards the concept of a large (and expensive) flood wall to protect large portions of the city, citing the many problems that this sort of a solution entails — very large costs with associated funding problems, potential cost and schedule overruns, unforeseen environmental consequences, and the worst fear of all - that the city will bank everything on this solution only to run into financial, legal, or technical problems years or decades down the road — leaving them high and not so dry. What the plan does do is propose a wide array of solutions — 257 initiatives in all. That way they can make incremental gains and move ahead as they have funding, rather than betting everything on a single solution. To develop their plan they divided the coastline into separate areas with different topographic features and looked at what solutions each one would need, such as sand dunes vs. floodwalls. They contracted with Swiss RE to use their computer models to analyze the impacts of storms as sea levels rise, the damage that would occur, and possible mitigating strategies. 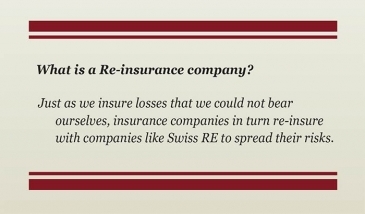 The re-insurance companies have a lot to lose with big natural disasters and climate change, so they have sophisticated models to analyze such events. The New York City team looked separately at all the areas that might be impacted — buildings, infrastructure, utilities, telecommunications, transportation, health care, and wastewater treatment. For example, 53 percent of the generating capacity that is located in the city is now in the 100-year floodplain, but this will rise to 97 percent by the 2050s. They then looked at what measures could be taken to protect the facilities, or provide alternate sources of power during emergencies, and what regulatory measures would be needed to make this happen. For buildings, they looked at what could be done to make the buildings more “resilient.” For example, changing building codes to require more “freeboard,” defined as the extra height above the projected 100-year flood level that key infrastructure like electrical and telecommunications equipment is placed at. The New York City plan appears to be a well thought-out, comprehensive one. So everything is OK and we can relax, right? Not so fast. First, the $20 billion does not cover all of the planned work to protect the city for the 2050s. It only covers the “Phase 1” work, which is expected to take the first 10 years, and at last update they were short $4.5 billion in funding. In addition, cost estimates were still being developed for Phase 2, and then the funding will have to be found for that. A more long-term problem is that the plan only looks at the sea level rise through the 2050s. But the sea will continue to rise beyond the 2050s, and likely at a faster rate than it did between now and then. 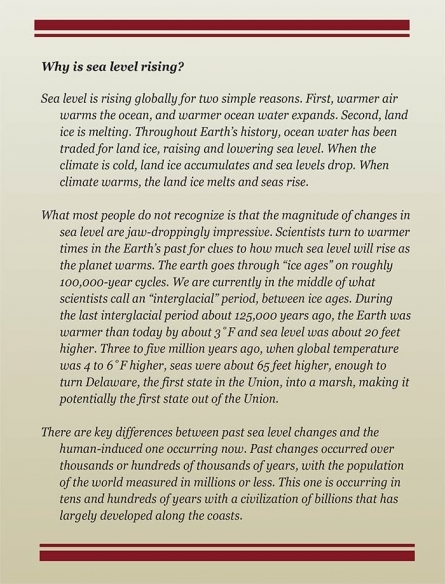 The Earth tells us from past warm periods that we can expect 5 to 10 feet of sea level rise for a each 1˚F of warming. Considering that the current limit for “dangerous” climate change is considered by the U.N. and many nations to be 2˚C or about 3.5 ˚F, which translates into something like 15 to 35 feet of sea level rise, and it would seem that New Yorkers may need to grow gills if they are to stay on the current waterfront as the decades and centuries pass. Clearly, as sea levels rise, it will become harder and harder to protect key assets. So where is the plan for 2100 or 2150? Most likely the cost to protect the city for the next 50 years beyond the 2050s will be much, much higher than to protect it to the 2050s. And it is hard to shake the uneasy feeling that New York may be fighting a hopeless battle, spending billions on a battle that absent any action soon on greenhouse gases and climate change, seems unwinnable. So while the NYC plan is certainly laudable, it is important to realize that it does not even contain 100 percent of the funding to take them to the 2050s, let alone look beyond that to 2100. But alas, 2100 is more than 20 election cycles away. When Bloomberg said, “We cannot, and will not, abandon our waterfront,” was he being realistic, or was it just political bravado? Perhaps his grandchildren will find out. The Miami metropolitan area also faces the challenge of rising seas, but with a number of interesting differences both physically and politically. Most of the area is within a few feet of sea level, meaning it will not take much of a storm surge to flood the city. Even now, when a high tide hits, water bubbles up through the grates in the streets and floods parts of Miami and Fort Lauderdale. The area also relies on the Biscayne aquifer for much of its water supply, and as sea level rises the fresh-salt water interface is moving inland — meaning wells that are close to the coast must be abandoned and moved inland to continue to get fresh water. This can only go on for so long before securing enough fresh water from underground sources becomes a problem. But perhaps the biggest issue for the area is that the land is made up primarily of porous limestone through which groundwater moves easily, which means that levees are not a viable option — water will simply go underneath. So if levees won’t work, what are the other options? There are typically three responses for rising sea levels: protection, adaptation, or retreat. Protection means building structures like levees to protect what is behind. Adaptation means taking measures like raising the existing buildings, or maybe just raising key equipment inside a building, like the electrical and communications utilities, so that the buildings can withstand occasional floods with minor damage. Last, you can retreat. That means picking up and moving to higher ground.